In 1987, on the Samoan island of Savaii, what is now known as the Falealupo Rain Forest Preserve was about to be clear-cut out of existence by a logging company  and along with it a small tree, known to the natives as the mamala tree, to botanists as Homalanthus nutans. An ethnobotanist named Paul Alan Cox saved the mamala trees and their forest. Now, if the research of Jay Keasling, who heads the Synthetic Biology Department in Berkeley Lab's Physical Biosciences Division, goes according to the plan, AIDS victims all over the world will have cause for celebration. Jay Keasling, a chemical engineer at the forefront of the emerging field of synthetic biology, wants to use Escherichia coli bacteria to synthesize genes from the mamala tree, which produces a promising anti-AIDS drug. Working through Keasling, who is a professor of chemical engineering at the University of California at Berkeley and a faculty affiliate with the California Institute for Quantitative Biomedical Research, or QB3, UC Berkely recently signed a landmark agreement with the Samoan government. The aim is to isolate the gene for prostratin, a chemical compound contained in the bark and stemwood of the mamala tree that holds enormous therapeutic potential as an anti-AIDS drug, and to share any royalties from the sale of a gene-derived drug with the people of Samoa. Under this agreement, Keasling and his research group will seek to genetically engineer a strain of Escherichia coli bacteria that can cheaply synthesize and mass-produce prostratin. "A microbial source for prostratin will ensure a plentiful, high-quality supply if it is approved as an anti-AIDS drug," Keasling says. "I think this agreement with the Samoan government could set a precedent both for biodiversity conservation and for genetic research, by including indigenous peoples as full partners in royalties for new gene discoveries that result from their ancient medicines." The story begins with Cox, who was once named a "Hero of Medicine" by Time magazine and is now the director of the Institute for Ethnobotany at the National Tropical Botanical Garden in Hawaii. Ethnobotanists study the ways in which indigenous cultures use plants for medicine. Which is why in 1987 Cox, then a researcher at Brigham Young University, was sitting in a thatched hut with an elderly Samoan woman named Epenesa Mauigoa. A tribal healer, she was describing for him the 121 herbal remedies she knew. Cox became particularly interested in remedy number 37. This called for boiling the bark from the mamala tree and giving the liquid to those suffering from what Samoans call fiva sama sama and we know as viral hepatitis. Samoan healer Ake Lilo prepares an antiviral extract from the bark of the mamala tree that he will used to treat hepatitis. The active ingredient, a chemical called prostratin, has also shown great potential for the treatment of AIDS. Drugs with potential antiviral properties are in high demand in the medical communities of developed nations, so Cox sent samples of remedy number 37 to the National Cancer Institute. In 1992, NCI researchers identified prostratin as the active ingredient in the mamala bark and found that it was indeed an effective treatment for hepatitis. However, they also found that it had powerful and unique therapeutic effects against AIDS: not only did prostratin prevent the AIDS-causing human immunodeficiency virus (HIV) from infecting human cells, it also forced dormant HIV virus particles out from hibernation within human immune cells, where they are protected from virus-killing medicines. Today's best anti-AIDS drugs can reduce a patient's HIV populations to safe levels, but as soon as the patient stops taking the drugs, dormant viruses emerge from their immune cell sanctuaries and quickly restore HIV populations to dangerous levels. Prostratin flushes out these "viral reservoirs" so that anti-AIDS drugs can eradicate the HIV population entirely. What's more, unlike other compounds from the same chemical family, which have been known to promote the growth of cancerous tumors, prostratin was shown to be a tumor suppressor. Preserving the mamala tree population in Samoa was a critical first step, but there is still a crucial need to be able to mass-produce prostratin in quantities far beyond what the bark and stemwood of the trees could supply. Enter Keasling and his synthetic biology research group, who have opened the door to adding new genes to E. coli bacteria by creating an E. coli strain with a new and specially designed metabolic pathway. Genetically engineered strains of Escherichia coli, the common bacterium, can be transformed into living factories that can cheaply synthesize and mass-produce disease-fighting drugs. Prostratin is a member of the huge isoprenoid family of chemical compounds, which are used in a wide variety of applications including as anti-cancer and anti-malarial drugs  plus as an assortment of flavor and fragrance additives. Genetic control mechanisms within the E. coli's natural metabolic pathway would interfere with the bacteria's ability to synthesize isoprenoid compounds, but Keasling and his colleagues get around this barrier by giving their E. coli strain a second metabolic pathway derived from yeast. This alternate pathway can be used to transform the E. coli into living factories designed to mass-produce a desired isoprenoid. Keasling and his research group first used their engineered strain of E. coli to produce a precursor to artemisinin, one of the most promising of all the antimalarial drugs. The success of this work led Keasling to Cox and his work with prostratin. Artemisinin and prostatin both belong to the terpene class of isoprenoids. "The basic superstructure of the bug we engineered to produce the antimalarial drug will work for producing prostratin," says Keasling. "Of course, we will need to add a few additional genes, but having the basic structure in place will save us both time and money." Keasling and Cox were both involved in the negotiations with the Samoan government. 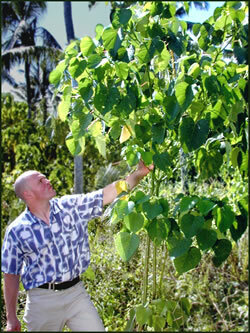 They traveled to Samoa this past August and met with the leaders of three Samoan villages where the mamala tree grows. 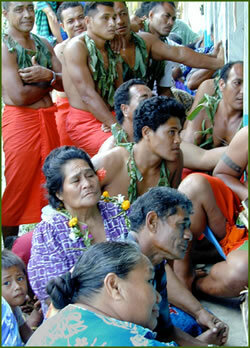 The Samoan people and UC Berkeley will get equal shares of any commercial proceeds from the prostratin gene sequence. 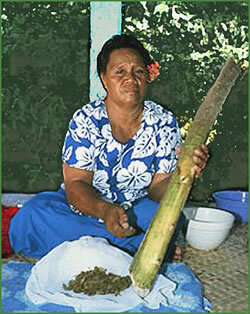 Samoan revenues will go to the government and to the villages and families of healers who discovered prostratin. "We gave a PowerPoint presentation in the Samoan language"  projected onto a white sheet hung in an open air village hall  "to the councils of the three villages and then to the Samoan federal government," Keasling says. "UCB was very generous in sharing 50 percent of any royalties received on the genes from the mamala tree. Since in this particular case the Samoan healers are actually the inventors, it is only right that they receive a large fraction of the royalties for their invention." The agreement was announced on September 30, in Apia, the capital of Samoa. Signed by Samoan Prime Minister Tuila'epa Aiono Sailele Malielegaoi and UC Berkeley's vice chancellor for research, Beth Burnside, it recognizes Samoa's assertion of national sovereignty over the gene sequence of prostratin and the intellectual contribution of the healers of Samoa. Any proposed licensing agreement between the university and a pharmaceutical company using the results of Keasling's research will require the company to make the drug available in the developing world either free, at cost, or at "very nominal profit," according to Carol Mimura, director of UC Berkeley's technology licensing office. Cox, who in 2001 had negotiated a royalty agreement between the Samoan government and AIDS Research Alliance, a nonprofit medical organization that is sponsoring clinical trials of prostratin as an anti-AIDS therapy, hopes the UC agreement will set a precedent. In announcing the signing, he said: "This is a very positive example of how a biodiverse-rich country has partnered with a major university to develop its genetic resources. I think other nations may seek to establish similar partnerships." 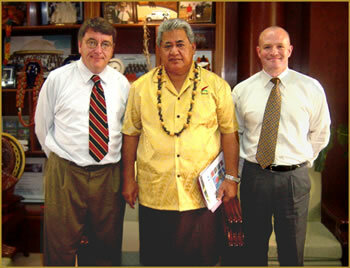 Samoan Prime Minister Tuila'epa Aiono Sailele Malielegaoi with ethnobotanist Paul Alan Cox (left), and chemical engineer Jay Keasling, negotiated an agreement that recognizes Samoa's sovereignty over the prostratin gene sequence and the contributions of Samoan healers. For Keasling, the scientific work is just beginning. Samples of malama tree bark will be collected, probably by the end of this year or early next. These samples will be frozen in liquid nitrogen to preserve their genetic material and brought back to Berkeley, where Keasling and his group will begin their search for the genes that are responsible for prostratin biosynthesis. 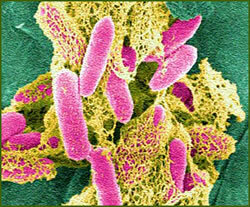 Once identified, the relevant genes will be inserted into their special strain of E. coli. "As part of the agreement, we intend to bring some Samoan researchers to Berkeley to learn the latest technologies in genetic engineering and synthetic biology. They will then be able to take this information back to Samoa." In addition to the enormous potential medical benefits to be realized from use of E. coli to mass-produce prostatin, Keasling sees enormous potential ecological benefits as well. demand for the drug. This could lead to a clear-cutting of the rain forests that contain the trees," he says. "While the Samoans could make some money from this venture, it would lead to a loss of rain forests and potentially many other kinds of drugs. By producing the drug in bacteria we save the rain forests from clear cutting, and the Samoans will get money from the engineered bug without having to do anything detrimental to their environment."